Canada/Belgium, 2018. dir. Kim Nguyen, 110 mins. Gambling, whether it´s high stakes like this one, or even the scratch cards, is a losing game. Perhaps less than one percent are lucky and hit the jackpot. In this film, it´s the other 99% that´s involved. High stakes stock trading - you want to make millions or bust. and bust it is in this drama-thriller. 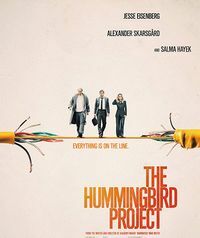 The film is about a pair of high-frequency traders (Jesse Eisenberg and Alexander Skarsgard) who go up against their old boss (Salma Hayek) in an effort to make millions in a fiber-optic cable deal. It had its world premiere at the Toronto International Film Festival and also screened at the Vancouver International Film Festival last September 2018. Interesting thriller. It´ll be worth your ten bucks to see it. .